If there’s one resolution all homeowners can make this year, it’s that no space should be left going to waste. This is especially true for lofts. Is your's just a dead area? Fit for nothing more than storing boxes? Here are some ideas to get your creative juices flowing, and your loft working harder. Speaking of resolutions, one of the most popular is to get fit. So why not transform your loft into your own personal gym? No more waiting in line for weights, or wondering why some machines are moister than others, now you have a haven of exercise. The perfect way to eliminate those pesky excuses. If converting your loft for this purpose, you’ll need to consider how sturdy your floor is. Could they handle excessive jumping? How about weights clanging down? It's advisable to avoid throwing down large weights, and instead stick to machines and dumbells, if building muscles is your plan. We also advise getting your loft assessed by an architect beforehand, to see if any reinforcement would be needed on the flooring or beams. They can also advise on how much space you have for equipment. Why not take inspiration from this property in Kingston-upon-thames? They’ve used a series of three, nearly floor to ceiling windows to flood the space with light. This is perfect for a bedroom, study, or just simply somewhere to curl up with a good book. One of the benefits of using large windows in the loft, as opposed to elsewhere in the house, is that you have a greater degree of privacy. Each year we help thousands of homeowners transform their property, and one of the most common reasons for taking on a big project, is the upcoming pitter patter of tiny feet - aka, babies. If you’re preparing for a new arrival, and think the loft would make an excellent future bedroom space, take inspiration from this Resi design. We’ve fitting two sleeping areas into the walls, to maximise the space. We’ve also added in a juliet balcony. These are great because they’re the only balcony type that doesn’t require planning permission, and they really help open the space up. For extra safety, this balcony has been designed to include a large, glazed railing. This not only keeps the children safe, but doesn’t obstruct the views, or stop any of that lovely natural light from pouring in. Looking at doing some a bit different? Something big? Then perhaps this impressive conversion in Germany could inspire you. 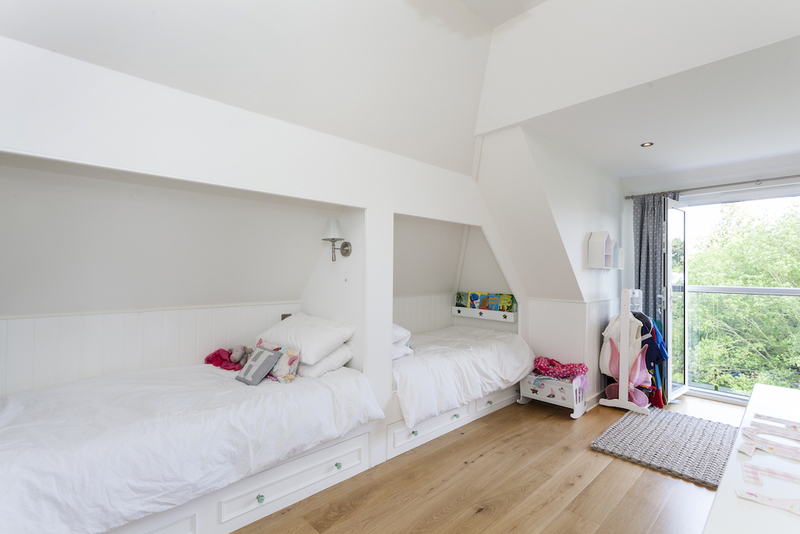 The size and design of this space makes this more than a simple loft conversion, and will require planning permission. It’s worth noting that designs such as this, which differ dramatically in aesthetic from the main building, do tend to be face harsher scrutiny than other projects. For this reason, it’s worth getting an architect with extensive planning experience on board. But all this extra effort can really pay off. This striking industrial style is beautiful, and offers great contrast to large amounts of greenery. A space like this would not only be a great private retreat for teens or older relatives, it could even be rented out, bringing in new income all year round. If a whole new build seems like a bit too much, but you still want to give your conversion the WOW factor, consider something like this fully glazed wall. These kind of features require structural glass, so are by no means a cheap project. However, if you have stunning local views, there could be nothing better for your home. Those of you with a keen eye might be wondering why someone would choose to have a bath so close to such an expansive window. Don’t worry, privacy glass enables you to enjoy your new space, without anyone peeping inside.